No matter where your journey takes you, these mixed-media, chunky-heeled boots make it a snap to look impossibly chic. With a current focus on outerwear, Pre-Fall 2018 brings the theme to the forefront while staying true the House roots. Inspired by the hiking world, these boots are presented in a dynamic mix of materials-rubber, suede, and the Original GG monogram canvas from the 1970s. A recurring detail of the latest collections, the Gucci logo is displayed in the graphic font of SEGA—a fixture in the colorful arcades and coin-op game rooms of the eighties. Crafted from black leather, black suede and black technical canvas with a rubber Gucci patch in SEGA font, used with permission of Sega Holdings Co., Ltd. Perforated padded ankle detail. Rubber lug sole. 10mm height. 145mm shaft height. Made in Italy. The Gucci collection is the pinnacle of Italian craftsmanship and attention to detail. These black leather, suede and canvas Flashtrek high-top sneakers from Gucci feature a round toe, a lace-up front fastening, a ridged rubber sole, a logo patch at the tongue, a merino wool lining and decorative perforations at the heel counter. Gucci - Gucci's hiking-inspired Flasktrek trainers are steadily becoming an iconic silhouette and this black wool-lined rendition is a cosy option for Resort 2019. Crafted in Italy with leather, suede and canvas-panelled uppers, they feature the house's SEGA-inspired logo patch at either tongue and sit on exaggerated black rubber soles. Team them with a graphic sweatshirt and monogram skirt for a weekday look with a directional edge. Gucci's boots are constructed of black tech canvas, suede, and smooth leather. This hiker style features a comfortable perforated padded collar and durable rubber sole. 1.75"/45mm heel (approximately). 4"/100mm shaft (approximately). Logo-embossed rubber wrap at rounded toe. Rubber logo patch at padded tongue. Perforated padded collar. Micro-diamond-textured heel stabilizer. Black rubber midsole. Black leather piping. Black round laces. Antiqued silvertone hardware. Lace-up style. Lined with leather. Rubber sole. Available in Black. Made in Italy. Ankle-high buffed leather, canvas, and suede boots in black. Embossed logo at round rubber moc toe. Tonal lace-up closure with D-ring and hook eyerows. Rubberized logo applique at padded tongue. Perforated detailing at padded collar. Tan leather lining. Tonal sculpted treaded rubber sole. Silver-tone hardware. Tonal stitching. Gucci combines heritage classicism with modern elements as seen with the Flashtrek High-top Sneakers, cut in lace-up construction, crafted from leather, suede and a technical canvas fabrication, featuring hiking hook and loop fastenings, chunky cleated rubber sole and Gucci logo tongue detail. Leather, suede and technical canvas fabrication Lace-up construction Hiking hook and loop fastening Chunky cleated rubber sole Gucci logo tongue detail Padded perforated leather cuff Aged silver-tone hardware Made in Italy Material 100%Leather. 100% Textile. 100% Rubber. Gucci hiker boot in suede, leather and GG Supreme canvas fabric. 1.5" chunky heel with platform. Reinforced round capped toe. Lace-up vamp. Rubber Gucci Patch at tongue in SEGA font, used with permission of Sega Holdings Co, Ltd. Padded perforated back collar. Dyed sheep shearling (Italy) trim and lining. Rubber outsole. Made in Italy. Gucci trekking boot in leather, tech canvas and suede. 2" chunky heel with platform. Reinforced round toe with logo. Lace-up vamp. Rubber Gucci game patch at tongue. Perforated padded top collar. Leather lining. Rubber outsole. Made in Italy. 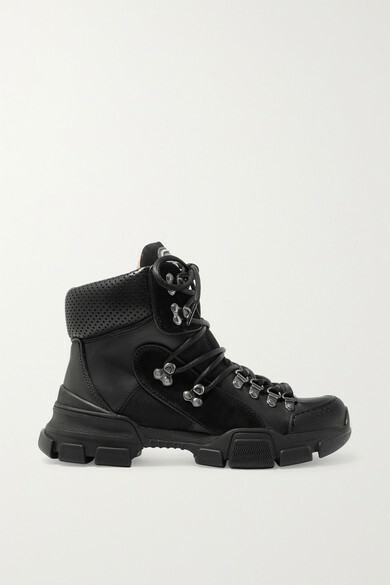 black Journey leather and canvas hiking boots from Gucci. Gucci combines streetwear and eccentricity in these Flashtrek high-top sneakers revealed on the Milanese runway. Alessandro Michele proves yet again that current fashion has no limits with this stunningly designed piece that mixes running shoes with mountain boots. With their deep black color, they go perfectly with shorts and an oversized sweatshirt. High-top snealer in black tech fabric, suede and leather. Gucci rubber patch with SEGA-styled lettering. Padded insert with openwork at ankle. Ridged rubber sole. 1.75"/45mm heel (approximately). 4"/100mm shaft (approximately).